The Cajun will be aimed at younger customers who can't afford the Cayenne, currently the brand's best-selling model. FRANKFURT -- Porsche AG said it would build its new Cajun SUV in Leipzig, Germany, creating at least 1,000 new jobs. The carmaker's supervisory board announced plans on Wednesday to construct a new facility in Leipzig with body assembly and paint operations. The Cajun will be the fifth model for Porsche and is expected to share the same platform as the Audi Q5, as well as a number of the Q5 components. The name Cajun is short for Cayenne Junior. 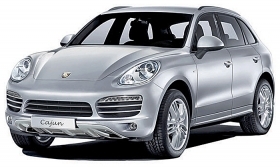 The model will be aimed at younger buyers who can't afford the more expensive Cayenne model. Porsche boss Matthias Mueller said the decision to build the smaller Cajun there was "proof of confidence in the capacities of our workers in Leipzig, as well as a contribution to the region's economic development." Porsche currently employs around 650 people in Leipzig manufacturing the Cayenne SUV, its best-selling model, and the Panamera four-door sedan. The automaker has already invested over 280 million euros ($390 million) in the city. Work on the 400 hectare (1,000-acre) site is set to begin this year, pending approval from the local authorities and production could begin in 2013, Porsche said.